Deriving their name from a Gothic horror flick starring Boris Karloff, their image from the diverse trappings of occult mysticism, mythology, and the supernatural, and their sound from an amalgam of late-60s blues-rock and progressive musics, Black Sabbath tran­scended all their influences to almost single-handedly write the first official chapter of heavy metal in the early 70s. Led by guitarist Tony Iommi and vocalist Ozzy Osbourne, they brought a new scariness and heaviness to the rock scene, presaging the arrival of today’s hard rock genre by decades. Paranoid, the title song from their second and perhaps finest album is a vivid case in point, standing as one of the most durable metal tracks of all time. 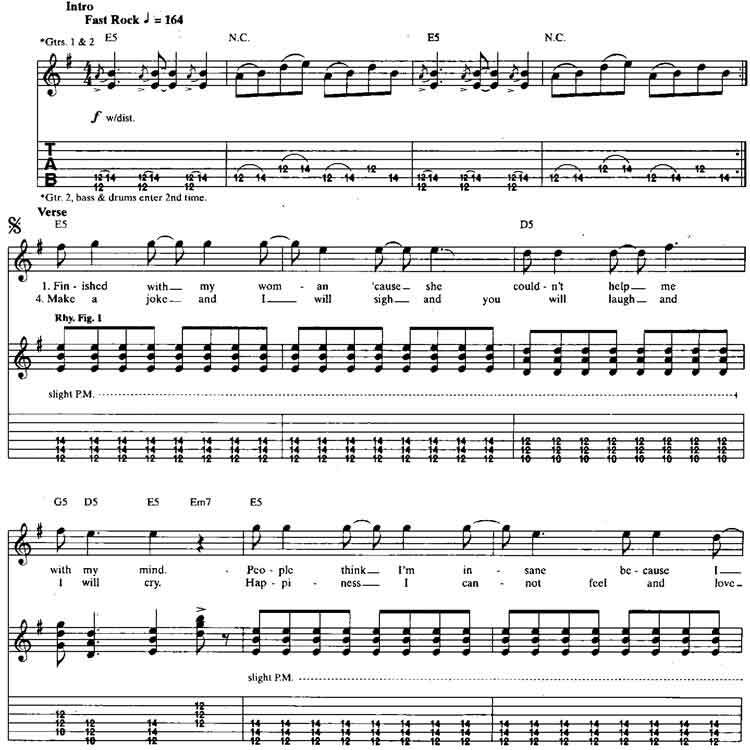 The opening riff is a Sabbath signature that has been seized and appropriated by countless guitarists. It is a quintessential early metal hook made of hammer-on figures in the 12th fret “blues-box” position. The first half involves hammering on from a two-note barred shape on the fifth and sixth strings, while the second half is based on hammered notes on the fourth and fifth strings [Fig. 1]. Use your index and third fingers to fret the patterns. The verse rhythm part, Rhy. Fig. 1, is a heavy power-chord figure based on the sixth-string root shape [Fig. 2]. Iommi plays the progression in parallel motion, both up and down and across the strings, with palm muting and a steady eighth-note pulse – a model for future metal rhythm guitar work. A figure like this may be common property in today’s heavy metal gene pool, but it was striking and innovative when it was first crafted some 25 years ago in the dark ages of Sabbath’s youth. The bizarre sound heard in Tony’s solo is the result of using distortion and a ring modulator on the right side of the stereo picture. Back in the 70s, a number of guitarists, including Jeff Beck and John McLaughlin, experimented with this effect, which was normally found in primi­tive synthesizers. Iommi’s solo lines are firmly planted in the minor pentatonic framework of blues-rock and are typically blues based, employing characteristic string bends, vibratos, and slurs. He favors two main E minor penta­tonic boxes with extensions into the next lower position for extra range. The two boxes are closely related. Fig. 3 is a version found in the 7th position and heard in the first eight mea­sures. The pattern in the 12th position [Fig. 4] is used for the next eight measures and is built from the typical E blues-box shape at the 12th position. It’s a part of Black Sabbath Paranoid guitar lesson. © 2012 - 2019 TabsClub Powered by TabsClub 42 queries in 0.252 seconds.